Perth travel agent Jazmin Haven will soon be wandering the weathered streets of Havana, soaking up the colourful city’s rich aromas and unique sounds, after winning an unforgettable seven-night trip to Cuba courtesy of TravelCube. Haven, from Flight Centre Hay Street, made the most bookings during February and March 2017 from TravelCube’s fast-growing Beach Collection – a portfolio of more than 10,000 properties in over 100 of the world’s top leisure destinations. Her reward is three nights at the Hotel Memories Miramar in Havana and four nights at the Memories Varadero, along with $3000 worth of airfares. The secret to winning the incentive, she says, was ‘love’ – or more accurately a fortuitous beach wedding booking. “One of my repeat customers is travelling overseas to a wedding in Bali and he walked in paid for his entire family and others attending the event,” says Haven. “It was still such a surprise to win and a wonderful way to be rewarded for working so hard. Helloworld Kincumber – four nights’ at the Sheraton Bali, two nights at the Royal Beach Seminyak and two nights at Istana Rama, Bali. For further information on TravelCube please visit www.travelcube.com.au. 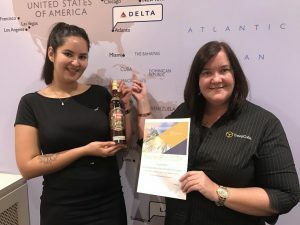 Perth travel agent Jazmin Haven receives her prize of a seven-night trip to Cuba (along with a bottle of Cuban rum) from TravelCube’s WA Sales Executive Sophie Weller.